"A boundary that divides the humid eastern U.S. and the dry Great Plains states appears to have shifted 140 miles to the east over the past century due to global warming," according to a study recently published in Earth Interactions, a journal of the American Meteorological Society, Doyle Rice reports for USA Today. The study's authors say the boundary will likely continue moving east in the future and profoundly affect agriculture, especially corn growers. 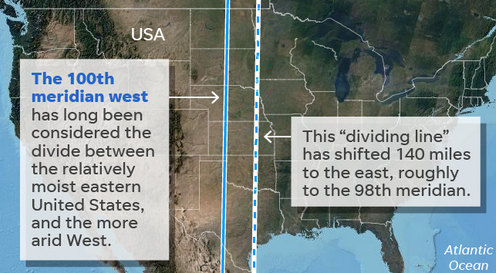 The boundary was at 100 degrees west longitude when American geologist John Wesley Powell identified it in 1878. The meridian roughly marks the eastern boundary of the sparsely populated Great Plains. Wheat grows well in the west, but east of the boundary, thirstier crops like corn thrive. Richard Seager, a climate scientist at Columbia University's Lamont-Doherty Earth Observatory and the study's lead author, "predicts that as the line continues to move farther east, farms will have to consolidate and become larger to remain viable," Rice reports. "And unless farmers are able to adapt, such as by using irrigation, they will need to consider growing wheat or another more suitable crop than corn."